This 1989 open Mediterranean Mainship was in need of some protection from the rain, so we created it a cockpit cover using some of our favorite products. We start out all of our projects by going on site to the boat. We bring out our special 3d device to take measurements. Our 3d measuring device is cost-effective and labor-saving. It saves us time taking measurements which in the end saves you money on your new cover! After we gather our measurements we need we head back to the shop. We upload all of our measurements we gathered and start working on the design process. We do all of our design work on the computer, creating a 3d design so we can see what the end product will look like. 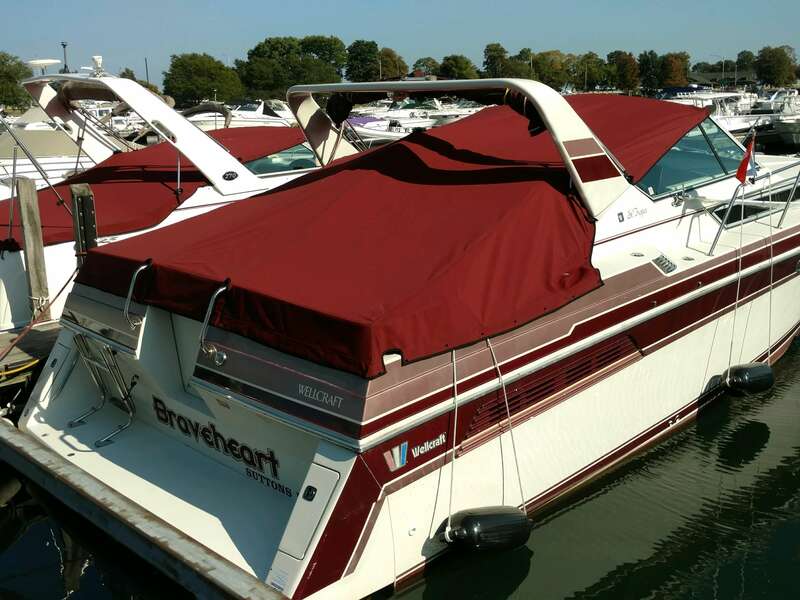 This way we can make sure to make any adjustments, or special needs that your cover may need on there instead of making multiple trips out to your boat. In this case we knew where all the poles for the framing of this boat were located, so during the design process we made sure to include them. After we finish the design process, we bring the design to our plotter, which is also a labor-saving, cost-effective tool we use here at Chicago Marine Canvas. It helps us save time by drawing out the patterned pieces of your new cover quickly, instead of us having to do it by hand. Then we hand everything over to our seamstress, who cuts out all the pieces and starts sewing them together. 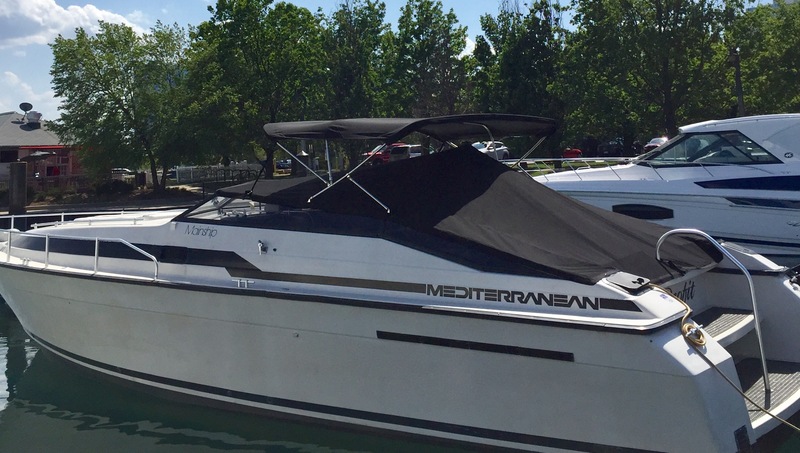 For this Mediterranean Mainship we used Sunbrella canvas in black along with black Sunbrella binding. Sunbrella canvas is one of our favorite products to use to create a new boat canvas for our clientele. It is fade resistant and has a 10 year warranty. To sew everything together we used GORE tenara thread which is UV, chemical, saltwater and extreme weather resistant. It has a lifetime guarantee and is great for outdoor applications. This thread will outlast your canvas. Our designer made sure to include all the locations of where the framing poles were, so we could make boots that wrapped around each pole, helping prevent water leakage from getting to the interior of this boat. We created custom boots and flaps using Sunbrella and velcro so that the cover would be nice and secure onto the boat. 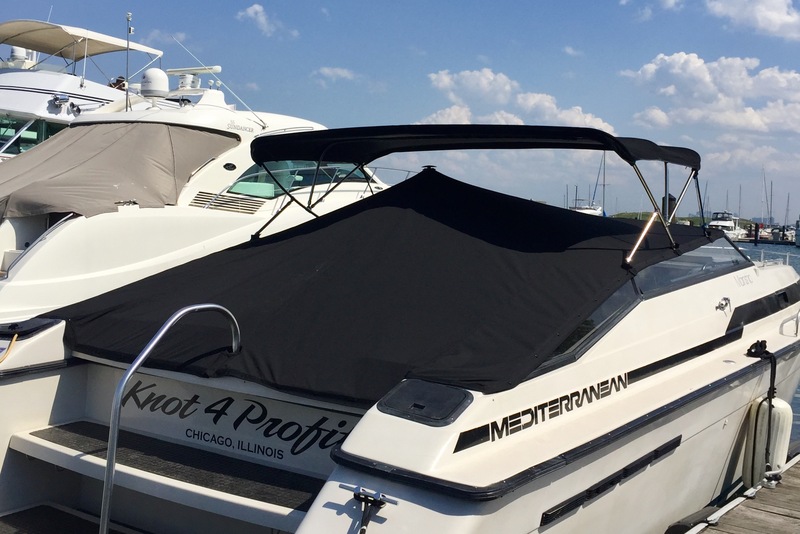 We attached the cover using DOT snaps in black, attaching from the top of the windshield to the back of the boat. We also used Boat Vent II to help with water runoff as well as ventilation in the boat. while your cover is up. 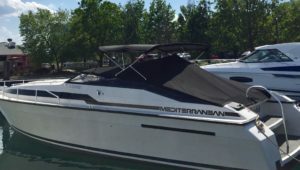 Since all boats are sightly different, we do only custom enclosures. Everyone has different framing, and other minor add ons. No boat is the same to us! The first step of our process is heading out to the boat with our 3d measuring device. It is cost-effective and labor-saving because it saves us time taking measurements and saves you money in the end. After we take measurements we head back to the shop to start doing design work on the computer. Our designer makes sure to meet all of your boats needs. Then we head the design over to the plotting machine which is another cost-effective, labor-saving device. The plotter draws out all the pieces of your new enclosure instead of us having to draw it out by hand. Then we hand everything over to our seamstress who cuts everything out, and then sews it all together. For this cover we used linen tweed sunbrella fabric, GORE tenara thread in clear. Sunbrella is a fade resistant canvas we use on most of our covers, and it comes with a 10 year warranty. GORE tenara thread has a lifetime warranty. The forward windows of this enclosure we used makrolon, which is a semi-rigid polycarbonate. It’s great of how clean it makes your new cover look. There is no sagging with makrolon, and no stretching and shrinking of glass, which is a issue here in Chicago due to the extreme hot summers and the extreme cold winters. For the Aft panels we used strataglass. Strataglass is the only vinyl on the market that comes with a two year warranty after install. We used Lenzip zippers on this enclosure which also has a lifetime guarantee. We even used their waterproof zipper for the roll up on the port and star side of the enclosure to ensure air flow while the enclosure is up! 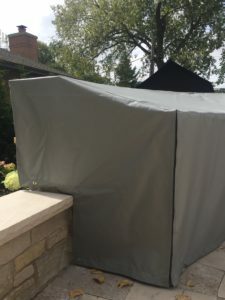 If you have a custom outdoor kitchen space you may be in need of one of our custom covers. Due to the different shapes, set ups and materials used, you may be unable to find one that will work with your custom design. With a custom cover from us, we make sure that your piece is totally covered and secured to the space. This is a great way to keep snow, rain, and debris off of a piece like this so it will last you many years through each change of the seasons. We always start off by coming out to your space and taking measurements with our 3d measuring device. This machine helps save us time and you money due to how quick and efficient the process is. After that we go back to the shop and do some design work on the computer, making sure we have all of your requests and needs in mind. Once we finish the design work, we plot out all of the fabric pieces with a plotter we have here in the shop, which also saves us time and you money! For this cover we used K Tex fabric in grey, Sunguard grey thread, and grey chain zippers. K Tex is a vinyl coated fabric that helps reassure that if water or snow sits on this fabric, it wont go through it. That way what is underneath this cover stays dry and safe from the outside elements. We used a fastener called twist the dot on this cover. The pieces attach to the outdoor kitchen themselves and then are secured to the cover. This way the cover wont fly away in high winds. We also added two zippers on each corner for easy on/off access to the kitchen area. As well as two zippers near the grill area, if these customers want to use their grill while keeping the rest of the kitchen covered. Custom shade sails are a great way to keep you cool all summer. 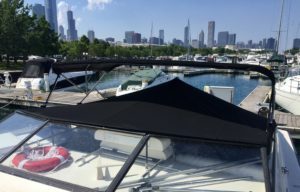 At the 31st Harbor in Chicago we replaced their old shade sails and made some brand new ones. We start off every project by going on site to do custom measurements with our 3d measuring device. This tool is great because it saves us time, which at the end of the day saves you money. It is quicker and more efficient then doing measurements by hand, especially on a project this size that could have possibly taken hours to measure due to the wind speeds and how high we would have had to have gone to measure at the tops of these structures. After we got our measurements, we head back to the shop to do some design work on the computer. Once we got the designs all figured out we started plotting them out with our plotter! We fabricated these out of Polyfab, which is a commonly used shade sail material. Their line called Comtex is perfect for medium residential projects as well as large scale commercial ones. It is a high strength fabric that can reduce 90% of UV rays. Comtex is made from virgin resins and has one of the best UV stabilizers that are both lead and heavy metal free. We also used GORE tenara thread, which has a life time guarantee. This means that the thread we used will outlast the fabric itself. It doesn’t get effected by the elements like other threads. 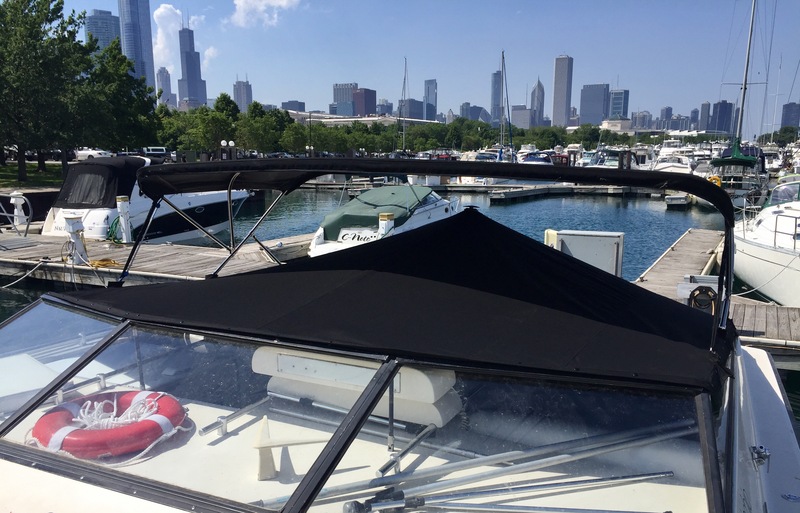 Along with the GORE tenara we used Polyfab’s shade sail 2″ edge webbing all around the edges of the shade sails. This is a polyester webbing that has a breaking strength of 4,700 pound force. Polyfab Comtex has a 10 year limited warranty. This means if your shade sail is installed properly it should last you ten years. The care for this product requires a mild dish soap and a low pressure water hose. Using any other kind of chemicals on this product can deteriorate the UV stabilizers as well as the fabric itself, this will void it’s warranty. This winter we did a full enclosure for this Sea Ray 460 at Chicago Yacht Works. We love doing jobs like this during the winter because we can really take our time to make sure that everything is perfect for when the boat hits the water in the summer! 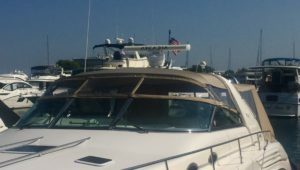 When we do custom enclosures we always save you some time and money by using our 3d measuring device to take measurements of your boat. Then we custom design your new cover to tailor to your boats specifications. 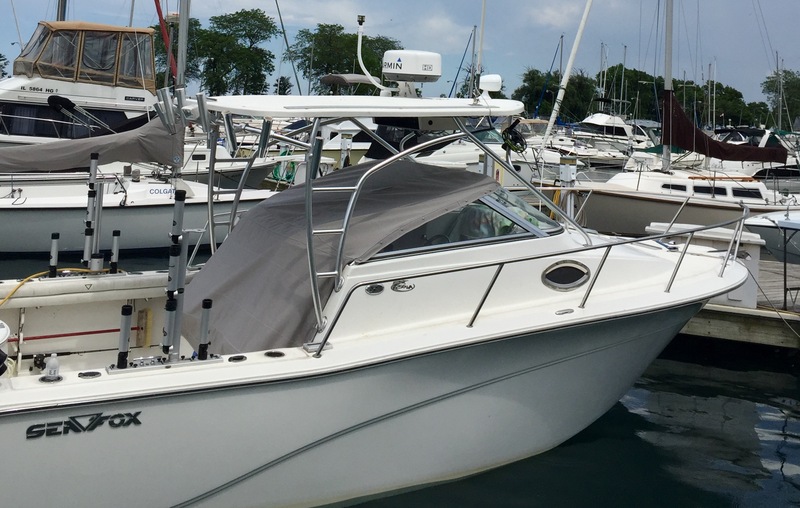 Here at Chicago Marine Canvas we want your new cover to fit like a glove! We also want to help you keep your boat dry along with it looking nice and modern! For this Sea Ray we used Sunbrella fabric in marine blue along with GORE tenara thread in black. For all of our enclosure we suggest that you use GORE tenara thread because it has a lifetime guarantee. That means that your thread will outlast your canvas. This also means that your seams won’t need repairs the whole time you have this canvas. 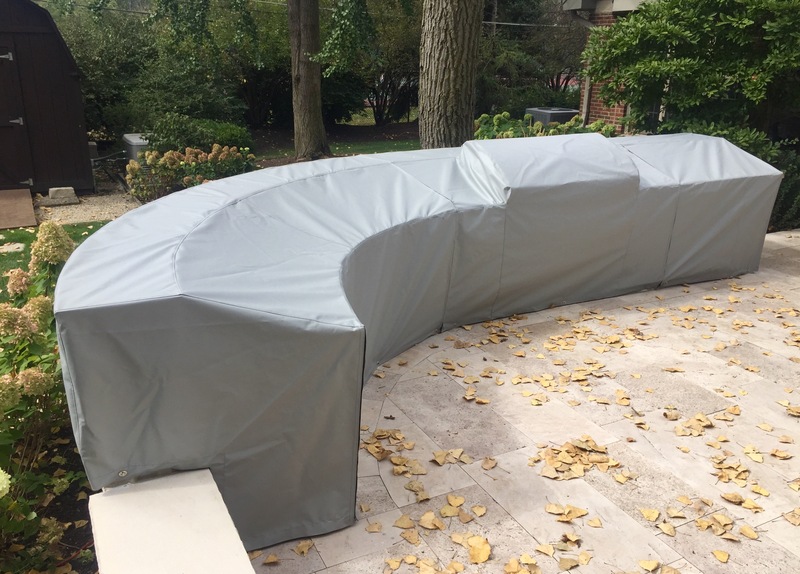 GORE tenara won’t get eaten by the sun or other elements, which is why we encourage our customers allow us to fabricate their new cover with this high quality thread! Say good-bye to repairs and hello to high quality! For the forward windows of this Sea Ray we used makrolon which is a semi-rigid polycarbonate. This material is great because it looks as if the windows are extensions of the actual boat windshield. Since it is a semi-rigid material there is no window stretching or contracting due to temperature changes in between seasons. For the aft windows we used strataglass. As of September 1,strataglass is the only vinyl on the market that has a two year warranty. For all these panels to stay together we used Lenzip zippers in black which have a lifetime guarantee. We fabricated a custom cockpit cover for this Seafox 256 fishing boat. For all of our work we create, we have to go out on site to take custom measurements. We do this with our 3d measuring device, which is quick and efficient. It saves us time and you money on your new custom cover. Then we head back to the shop and we start designing your cover on the computer. 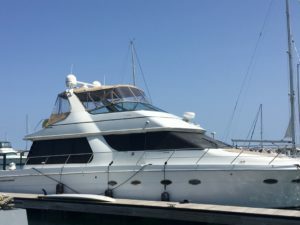 We make sure that we have covered all of your concerns and needs due to every boat being different. After we finish up the designing process we have our plotter draw out all the pieces of fabric, then we hand everything over to our seamstress and the cover is assembled. 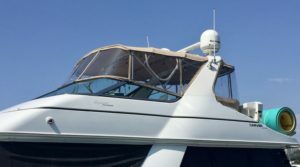 Since the Seafox 256 is more of a fishing boat, we made a cockpit cover that attached onto the top of the windshield with DOT fasteners and then extended over and down the back of the captains chair. 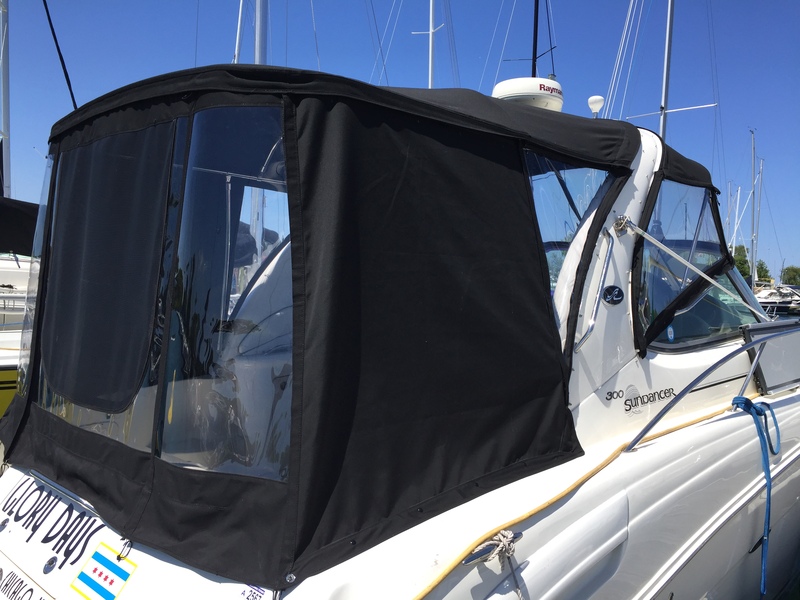 Now all of this Seafox’s upholstery is protected from rain and other elements all season long while on the water. This cockpit cover is fabricated out of Sunbrella fabric in cadet grey with GORE tenara thread in grey. GORE tenara thread has a lifetime guarantee which means it won’t get eaten by the sun. Sunbrella fabric is fade resistant and has a 10 year warranty. Since this cover sits against the captains chair we added a soft fabric called evolution which is easy to clean. It adds protection to the boat cover so it wont rub up against the seat causing any wear and tear to this boast upholstery work. Evolution is also mold and mildew resistant and dries quickly if ever wet! We used grey DOT snaps to secure this cover onto this boat. No wind will be ripping off this cover this summer! Here in the city a lot of buildings have recreational areas on their rooftops. Some of them have permeant furniture that stay up all year round, rain, sleet, or snow. Its important to protect your outdoor furniture from the sun and other elements to help them last longer. These customers had a u-shaped couch that needed to be protected all year round. So we went on site on site to where the couch is located. Once we get out there we get out or handy 3d measuring device. This thing is so easy and efficient to use that it ends up saving us time and you money at the end of the day. After we get our measurements and take some photos of the area, we head back to the shop and start the design process. When designing this cover we made sure that water and snow could run off of it by making sure that there was a nice tight 45 degree angle from the back of the couch down to the front area. After we finish up the custom design, we plot out all of the pattern onto the fabric and let our seamstress get to work! We used Sunbrella fabric in black to create this cover along with Sunstop polyester thread in black. Sunbrella is fade resistant and has a 10 year warranty! In each corner of this cover we put a chain zipper for easy on and off access. If they want to access a part of the couch they can leave the other parts covered, and it also helps it get on a little easier! Around the edges we added 2″ black webbing for extra reenforcement so we could securely attach the cover to the couch. That way when the great winds of the windy city come, this cover is safe and securely attached, making sure that this couch will be dry through all the seasons! This Sundancer 300 was in need of a new full enclosure. We always begin our process by going out to the boat with our team to take measurements. We use a 3d measuring device that is quick and efficient, which saves us time and you money at the end of the day. After we take the measurements, we head back to the shop to start the design process. We do all of our design work on the computer, making sure to custom tailor your new cover so that it fits perfectly. Once we finish up the design work, we have our plotter draw out all of the patterned pieces for this enclosure. Then we hand it over to our seamstress so they can get to work. For this project we used Sunbrella in black, GORE tenara thread in black, and Sunbrella binding in black. GORE tenara thread has a lifetime warranty which means no more sun eaten seams. We also used Lenzip zippers in black which also have a life time guarantee. For the front windows we used Makrolon which is a semi-rigid polycarbonate. The great thing about Makrolon is that it doesn’t sag like other vinyls. It also doesn’t expand or contract in different temperatures that way your cover always look brand new. With Makrolon your new enclosure looks like an extension off of your windshield, making your new cover looking super clean and chic. The aft windows on this boat are Strataglass. We used large pieces of glass for maximum visibility. Strataglass is now the only vinyl on the market that comes with a 2 year warranty after install. We also created large canvas panels in the aft area of the boat, on the port and star side to help with shade while out on the water. After we fabricated a new cover for this customers neighbor, he called us wanting a new cover as well. 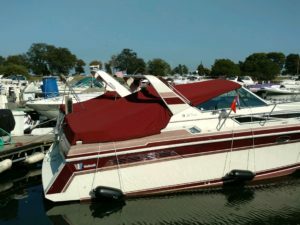 This 32′ 1988 Wellcraft St. Tropez needed a new cockpit cover to keep its interior dry! We do each cover we create custom, which requires us to go out to each boat. We do this because each boat is set up slightly different. Whether it be a minor adjustment to framing or the overall set up of the boat. 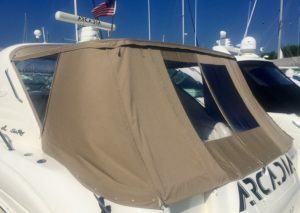 That way your cover fits your boat like a glove! Our first step is to take 3d measurements of the boat quickly and efficiently. Our 3d measuring device is cost-effective and labor saving, which means it saves us time and you money! After we take measurements we head back to the shop to do design work on the computer making sure that our designer meets all your boating needs when it comes to your new cover. After we finish the design work, we head over to our plotter which is another cost-effective, labor saving tool we have here at Chicago Marine Canvas. After it’s all drawn out, we give everything over to our seamstress and she sews it up. For this cockpit cover we used Sunbrella fabric in the color dubonnet tweed along with Sunguard polyester thread in black. We did cut outs for this boats poles that had custom cuffs and velcro flaps to ensure security of the cover onto the boat, as well as preventing water from getting into where the poles are on this boat. We used a boat vent II to ensure airflow so that no mildew or must get stuck inside the boat if the inside ever gets wet! We also put 2″ black webbing all around the bottom edge of this boat to to reenforce where we placed each one of the snaps. For snaps we used DOT fasteners in burgundy to blend into the cover. 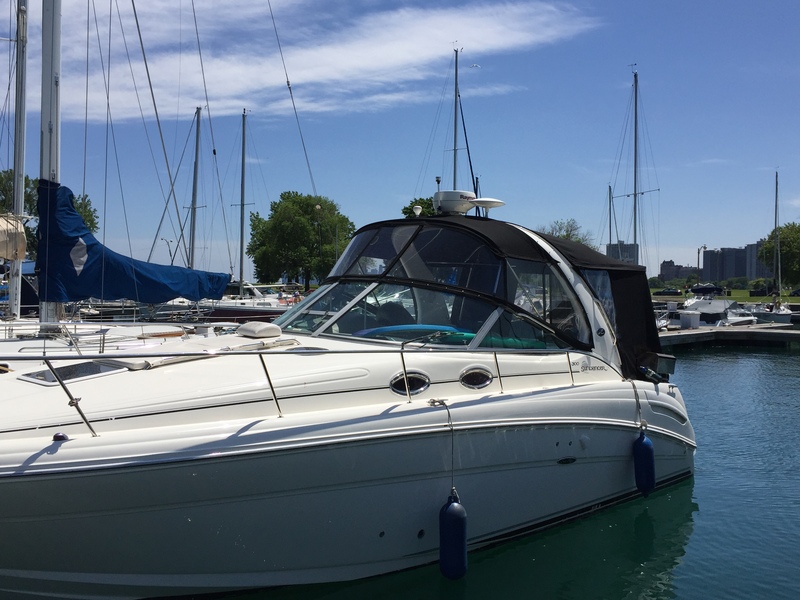 This Sea Ray was in need of a new full enclosure, as well as new framing. We went out with our 3d measuring device and started to get to work. We first took some measurements of the boat so we could make sure the new custom framing would fit the boat properly. After that we headed back to the shop and started working on that first. After we installed the new framing, we brought our 3d measuring device back out to the boat and took measurements for the new custom full enclosure. Then we headed back to the shop to start the design process on the computer. Our designer makes sure to meet all your needs and all the special custom things that your boat may have, so that your new cover can fit perfectly! After we finish the design process we bring the design over to the plotter which helps us speed things up by drawing out all the pieces of the full enclosure. Then our seamstress cuts everything out and starts sewing all the pieces together. For this enclosure we used toast tweed Sunbrella fabric, GORE tenara thread, and Lenzip Zippers. Both GORE tenara and lenzip have a lifetime guarantee, which means the thread and zippers are going to outlast your canvas! For the forward windows we used Makrolon which is a semi-rigid polycarbonate. Makrolon is great because it can’t expand or contract during the summers or the winters, and because it is a harder glass it looks as if you have a extension off of your windshield. For the aft windows we used Strataglass. 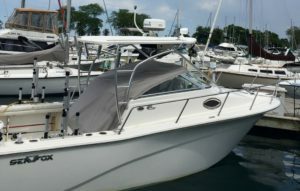 Strataglass now offers a 24 month warranty on their products after they have been fabricated and installed on your boat. It is now the only vinyl on the market that has a warranty. We used DOT fasteners in winter wheat so that they would blend in to the fabric!